Come Join Us On An Unforgettable Tour Of Utah! From The World Famous National Parks Of Southern Utah, To Utah's Amazing State Park, Antelope Island. We Will Also Visit Utah's Spectacular Uinta Mountains. Day 1 - Arrival into SLC, UT International Airport. Transfer to SLC Hotel, Where you will get a good nights rest to prepare for the days ahead. Day 2 - Your Tour guide will meet you at your hotel where you will meet your tour group, board our private van and embark on our journey towards Zion National Park. We will arrive at the park, set up camp and explore the area. Including visits to Emerald pool, Weeping Rock and Watchman Trail. 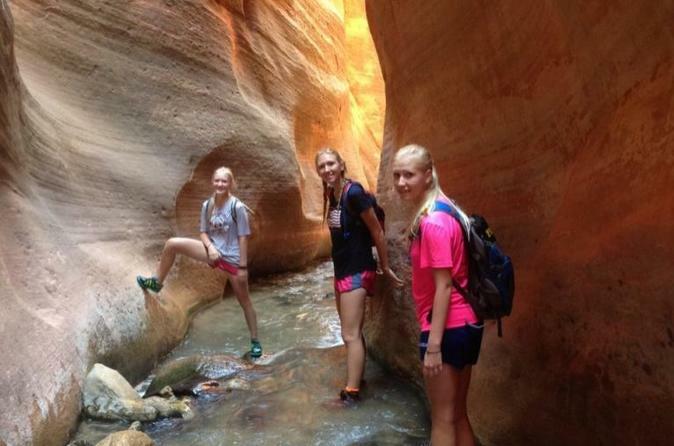 Day 3 - After a good nights rest, we will hike a true Jewel of Zion National Park. The Narrows or The Subway. (Permit Pending). Both options are "all day" hikes and will take your breath away! Day 4 - Break camp and enjoy the morning in Zion National park. Hiking Angels Landing! After which we will Leave the Park and spend the Night in Fillmore, UT. Day 5 - Arrive in Arches National Park. Set up camp and Explore nearby arches. Including Balanced Rock, Sand Dune Arch and Double O Arch. Day 6 - Before Breakfast and the Sun rises, we will depart early to witness the Sunrise at Delicate Arch. After returning to camp, relax a bit and then continue exploring Arches. Including Skyline Arch and other nearby hikes. Day 7 - Break camp and enjoy the morning in Arches National Park. Hiking and visiting Fiery Furnace (Permit Pending). This hike will take the majority of the morning and afternoon. We will then depart Arches and Return to SLC. Checking into our hotel and enjoying a shower! Day 8 - SLC Free Day. We have found that after a week of visiting the National parks its nice to have free time. Enjoying Salt Lake City. Visit Temple Square, Local Malls and restaurants, and resting for the days to come. Day 9 - Leave Hotel 9:00am and arrive at Antelope Island. This is one of Utah's Amazing State Parks. Here we will hike Frary Peak, where you will be among wild Bison (Buffalo) and have amazing panoramic views of Nothern Utah. Camp on the Shores of the Great Salt Lake. Day 10 - Break Camp after an amazing breakfast! Leave Antelope Island and head into the Utah Backcountry of the High Uinta's. Set up camp and visit some nearby lakes and waterfalls. Day 11 - Hike one of the Uinta National forests highest peaks. Bald mountain. Just shy of 12,000 feet. 11,942 to be exact. Spectacular hike and views! Day 12 - Break Camp and continue exploring Utah's Uinta National forest. Leave the Uintas and arrive at our Hotel in SLC, where the tour will end.